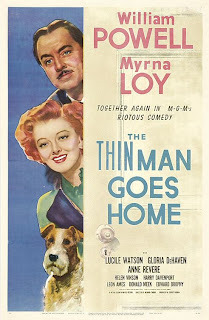 Thin Man number five, and I am still giving the movie four stars. Although, I just read that this Asta is not the original Asta, and that is making me a little bit sad. This Asta is just as good of an actor as the original, though. He even has a happy dance for when things are going well. So, in this movie Nick and Nora go off to visit Nick's parents. Nick is prepared for a restful vacation, but of course there is a new murder to solve. Nora is thrilled about the case, hoping that this will be Nick's chance to finally show his dad that he is a great detective and has chosen the right career. Nick being Nick, he works on the case while pretending not to work on the case, driving Nora so crazy she eventually tries to take it on herself. Also, the bonus to being at Nick's childhood home, is that when the final scene comes around with all the suspects gathered together in one room, Nick's mom is there to make them "cocoa to calm the nerves." You failed to mention that two of the villains are a Mr. and Mrs. Drake! (That's my maiden name). Very important. It does drive me crazy a little how Nick's dad never seems impressed with anything Nick does because he's not a doctor. I get just as mad as Nora. My favorite part is the young girl who practically throws herself at Nick at every opportunity. "Someone's always hitting that poor Mrs. Drake!" Nice blog! Found it when googling on Cary Grant pictures. 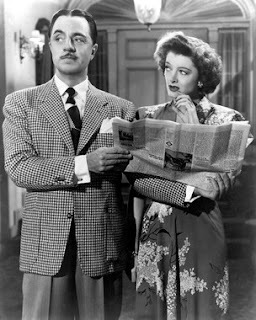 I will link to it from my Classic Film Blog! Keep up the good work.